This past year, I've been gaining a lot of weight. Nonstop. And I can't help it; I'm addicted to sweets and prone to over-stuffing myself. To top it off, I'm going on a cruise this summer, and cruise=unlimited free food=unlimited fun, but also unlimited weight gain. 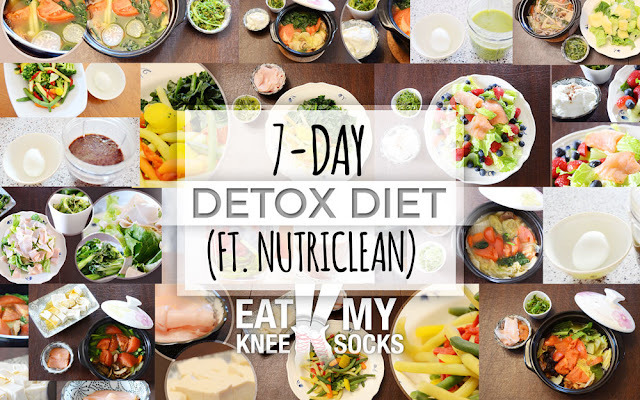 So, I decided to try out a 7-day detox, paired with a diet! I picked NutriClean's 7-Day Digestive, Liver, and Colon Maintenance pack and subjected myself to 7 days of sugar-free (well, almost sugar-free) sadness. Read ahead to find out what I ate and what the results were! The NutriClean's 7-Day Digestive, Liver, and Colon Maintenance pack comes with its own manual, which includes instructions on how and when to take the pills and fiber powder. The manual also outlines a list of things/foods to limit and things/foods to completely eliminate while doing the detox. I, however, followed a specialized diet instead. This diet required that I eliminate oils (cooking oils and such), grains, and processed sugars. I also couldn't have any protein until day 4, but I broke that rule because I can't live without protein. Everything came in a small box, with the logo on the front and the simple instructions on the back. 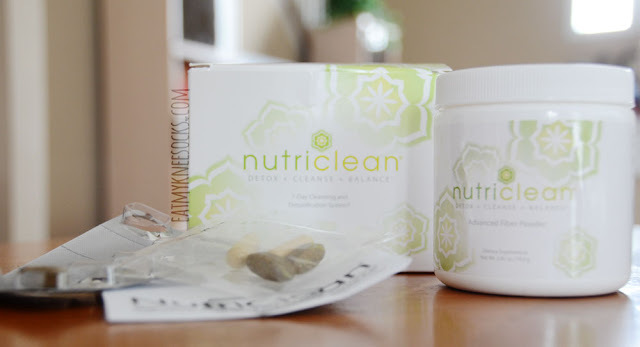 The NutriClean detoxing, cleansing, and balancing pack has three parts: Release tablets, HepatoCleanse pills, and Advanced Fiber Powder. On day 1, I woke up, super excited and ready to start my detox! I took two of the Release pills (dark-colored) and mixed a scoop of the fiber powder with water, as instructed by the manual. The fiber powder had a weird, sweet taste to it; it smelled nice, but I didn't like the taste very much. I forgot to take pictures of my meals on the first day. Strangely enough, the simple combinations of vegetables and fruits made me feel fuller than I'd expected. On the other hand, the satiation didn't last long, and I found myself struggling to resist the temptation of grabbing an ice cream bar or two. Also, at around 3:00 pm, I started getting headaches and feeling tired. 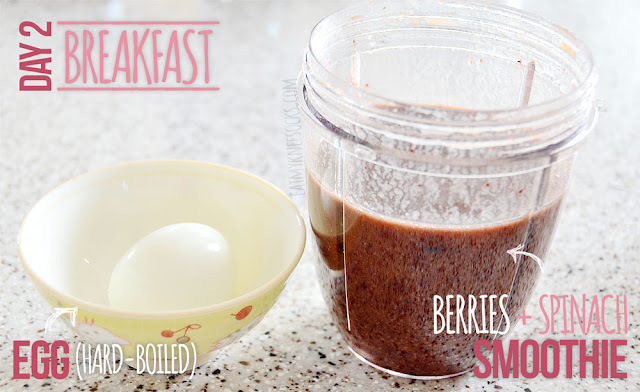 Breakfast was a berry smoothie and an egg, same as day 1's breakfast. For lunch, I had a soup with mushrooms, tomatoes, radishes, and watercress in chicken stock, along with some seaweed salad. 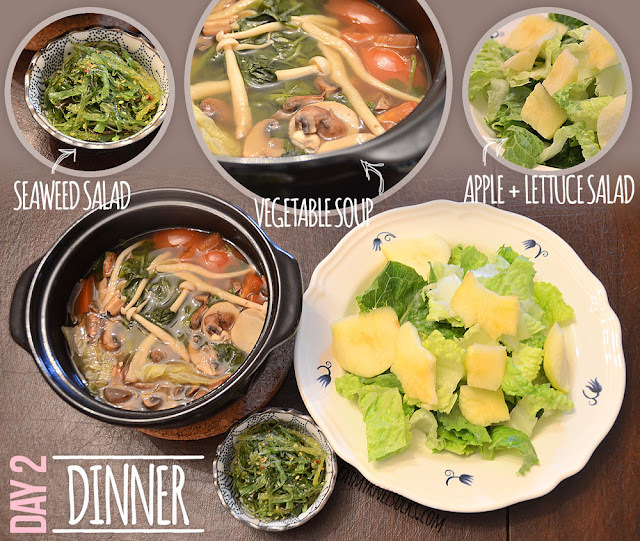 Dinner was a similar vegetable soup (with spinach and lettuce instead of watercress this time), with seaweed salad and an apple-plus-romaine-lettuce salad. I found that the mixed vegetable soups tasted pretty good, as well as the seaweed salad. I hate regular salad, though, and so far that hasn't changed. In addition to the three meals pictured above, I also had some honeydew for a snack. Compared to day 1, I found that I was less tired and had no headaches in the afternoon. 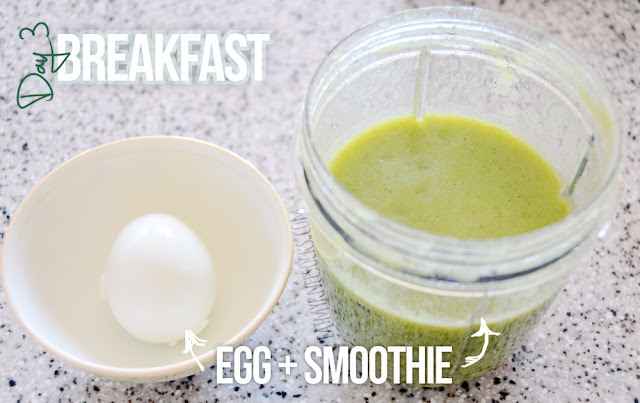 For breakfast, I had a pineapple, kiwi, apple, orange, and spinach smoothie along with a hard-boiled egg. 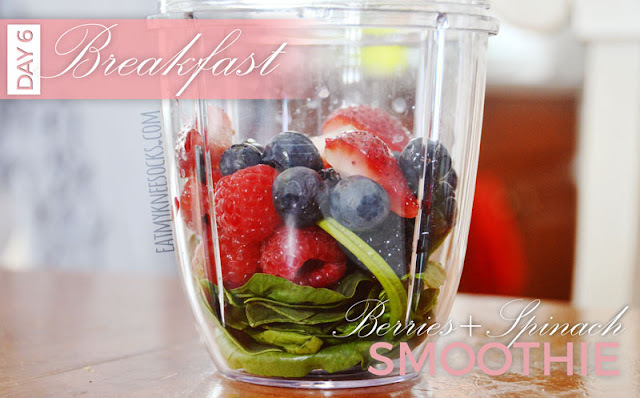 I found that this smoothie was a lot sweeter and better-tasting than the berries-and-spinach one. 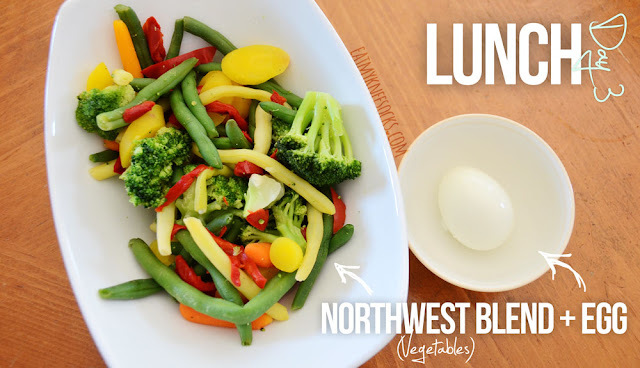 Lunch was comprised of another hard-boiled egg and a plate of steamed Northwest blend vegetables. Dinner was the happiest meal, with mixed-vegetable chicken-stock soup, seaweed salad, and nonfat Greek yogurt. In the afternoon, I treated myself to some chocolate. The manual suggests eliminating processed foods, but I couldn't stop myself :'))) Overall, day 3 went well! Breakfast was a smoothie with berries, cucumber, and pineapple added for sweetness, along with a hard-boiled egg as usual. I had a chopped lettuce salad for lunch, but spiced it up with strawberries, blueberries, and savory smoked salmon for a blend of sweet and salty flavors. I also had cinnamon-topped Greek yogurt and seaweed salad on the side. 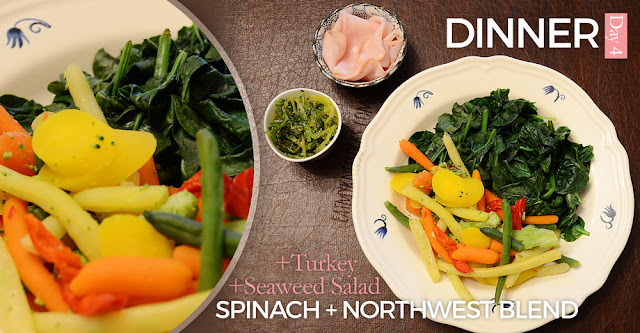 Dinner was a mix of steamed, salted spinach and steamed Northwest blend vegetables, along with a few slices of honey-roasted turkey breast and some more seaweed salad. I also had some cucumbers as a snack. There weren't any noticeable weight influxes from day 4 to day 5, but my waist did get another .5 cm smaller. I had a weird-looking but decent-tasting smoothie for breakfast, made with bananas, strawberries, blueberries, and spinach. 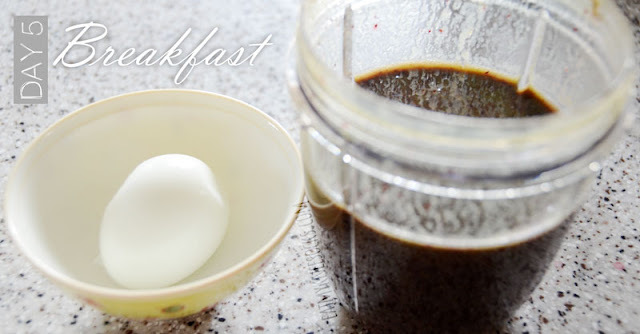 I also had a hard-boiled egg, my new breakfast staple. 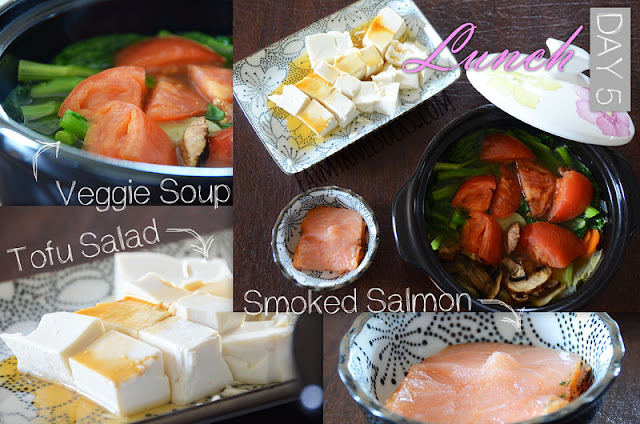 Lunch was my feast of the day: I had tofu salad, smoked salmon, and a mixed vegetable soup. This was actually a meal I could see myself eating on a regular, non-detox day too! Dinner was steamed yu-choy, a turkey-breast-and-lettuce salad, and some seaweed salad. I went shopping all afternoon, so I didn't have the time to grab a snack. I forgot to weigh myself on day 6, and found that my waist was about the same as day 5. I returned to the old berries-and-spinach smoothie for day 6, along with a hard-boiled egg that isn't in the pictures. 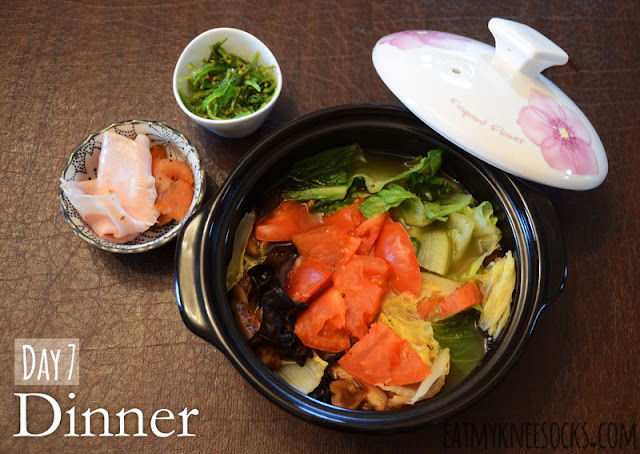 For lunch I had a mixed vegetable soup, seaweed salad, and smoke salmon. For dinner, I had a plate of steamed vegetables, a plate of tofu salad, and some honey-roasted turkey slices. I also had some more chocolate, because life just isn't fun without chocolate. WOOOO! Finally, day 7, the last day of my detox and diet. I measured and weighed myself; I lost another .8 pounds and 1 cm off my waist! What can I say? It was one hell of a week, and I had a hard time adjusting to the diet, especially considering how I spend most of my days eating 3,000 kcal+ of chicken wings, fried rice, cookies, granola bars, and ice cream. In terms of the product itself, I had no issues with the pills and capsules, though I wasn't a huge fan of the flavoring of the fiber powder. I'm not sure if I spilled too much powder, but I did notice that there wasn't enough powder for a full scoop on the last day. This detox left me feeling a lot more energized afterwards, so I'd say it was effective. In the days afterward, I also felt less of an urge to stuff myself with cookies and chocolate. In total, I ended up 3-4 pounds lighter and lost 3 cm off my waist! It's easy to lose a couple of pounds, but it's also easy to gain it all back, especially when you've got a kitchen full of sweets and snacks. So here comes the important question: did the results last? Well, it's been two weeks since the detox. I'm still about 3 pounds lighter than I started, and my waist is around 2.5 cm smaller than before. I'm feeling the sugar cravings start again, but so far it's been pretty good. Would I recommend it? Maybe. I'm pretty happy with the results myself, though I definitely can't speak for everyone, since everyone's body reacts differently to diets and whatnot, and there's really no way for me to know if someone else would have the same results or drastically different results, or if they'd experience any side effects or not. It's not the cheapest detox out there, and the results that I experienced are rather mild, but I like it. Would I use it again? Another maybe. NutriClean recommends detoxing twice a year, which sounds reasonable. I don't know if I'd have the effort to go through the whole restrictive 7-day-diet thing, but if I just follow NutriClean's manual's suggestions it's not too hard, and I might try that someday. I've never bothered with detoxes or diets before (I'm more of an all-you-can-eat buffet-style eater), but this was a fun, interesting experience! I hope you found this post interesting (or at least liked the food pics ;) #foodporn), and, as always, thanks for reading! How did you make your soup? Do you have a recipe? The detox center should have a proper license. This is the first important thing to check. Security of the patient will dependably be the main need particularly amid these circumstances.